The front label says a lot too. I have included a larger picture so the detail can be appreciated. 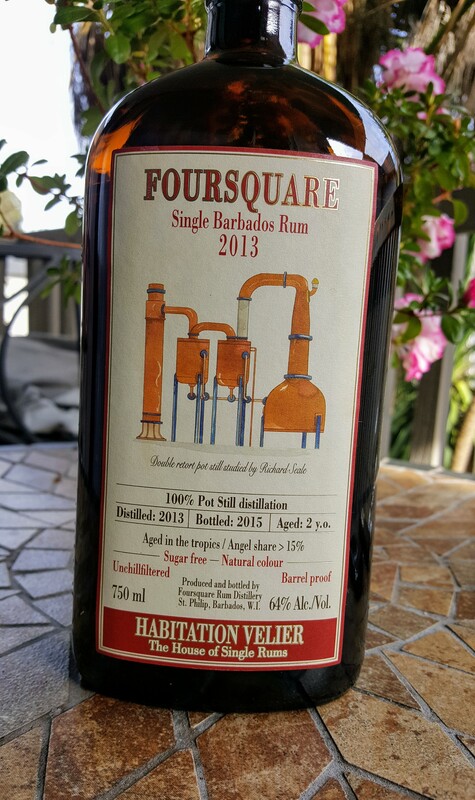 Foursquare has been doing a lot of these special bottlings from special barrels. Port, Zinfandel, Sherry (the Premise) and now Cognac barrels. Each one is spectacular and so far every one I’ve tried has been better than the last! Not only great barrels, but this offering is “cask strength” bottled at the alcohol percentage as it comes from the barrel after two years (clearly stated on the label) having experienced 15% evaporation (the “angel’s share”) in tropical aging. The note about the tropics is important because rum ages (and evaporates from the barrels) faster in the tropics. Two years of aging in the tropics would be equivalent to four or five years in a temperate climate. The rum comes to us from the cask at 64% ABV, a potent offering. Color: Light to medium amber with orange notes. This is a very pretty rum. Legs: Swirrled in the glass the rum shows thin to medium fast running legs. Aroma: OK, now to something more important. I expected a two-year-old rum to be a heavy on the alcohol, acetone, or varnish notes especially at 64%, but not so. There is alcohol there, but it’s clean, refreshing, and sets off otherwise deliciously deep aromas of raw sugar, light caramel, prune, raisin, and tobacco. Wow! Fabulous dark aromas from a relatively light rum. There is no vegetal or fruity funk in this aroma. Lightly sweet, but not overwhelmingly sweet. Dark fruit, but no over-ripe notes. I take this to be characteristic of a “Bajan rum”, and I don’t mind a little funk now and then, but this is so much more friendly. Flavor and texture: Amazing! A rum with no additives this is immediately rich and creamy. How can that be with this much alcohol and only two years old? I imagine the tropics, and maybe the quality of the ex-cognac barrels makes all the difference. Despite its richness the rum comes off at first as crisply clear and dry, but the sweetness of it sneaks up on you. Raw sugar, caramel, not dark but light. Raisin, prune, and tobacco. I can’t remember another rum in which the flavor and aroma profiles matched so well. The finish is long and sweet, no bitterness here not even at its full 64% ABV. The heat sneaks up on you too. It never gets harsh, but it does get pretty hot! I added a little water to one glass taking the alcohol down to about 55% and the rum gets sweeter, the raw sugar a little stronger with green grape making an appearance. But this rum is easy to drink even at its original ABV. Like the aroma, there is no sort of funk in the taste. At $75 the price is a tad steep for me, but it is the same price (roughly) as the 2004 and 2005 all well worth their cost. Velier has released almost a dozen collaborations in this series, not all with Foursquare. Of them all, this offering is the least expensive! I haven’t dared try the others ranging in price from $90 to $120! What if I like them??!! If you click on this link, you can see images of all the other offerings in this line. Good luck making a choice. My guess is they will all be outstanding examples of their types. The Fat Rum Pirate and The Rum Project have reviewed other of the rums in this set. Have a look. These folks know their rums better than me. Philosophy Now Magazine has published a letter of mine in issue #129 responding to an article in issue #128. For reasons of space and others editors edit. That’s what they do. But in this case, the editors deleted some of the logical structure of my argument, particularly in the last part, my four-point summary. For reasons of completeness I replicate my original letter below. Interestingly, this particular letter, in only 500 or so words, encapsulates much of my philosophy work here on the blog and in my books. In particular see: Why Free Will? If there is a God questions about his (this pronoun for convention) motives will inevitably be speculative because our perspective is narrow while God’s would be, by definition universal. But the range over which we speculate can be narrowed. Answers must accommodate everything for which God is purportedly responsible directly or indirectly. For example, if God exists he must be “necessary being”. A contingent God is not God. By the same token, he must have certain other absolute qualities: infinity, unity, free (and unconstrained other than by logic) will, eternality (existence outside time, uncaused cause), unified purpose, and so on. Speculation must also accommodate human experience, the physical universe of time and space, that we are made out of this physical stuff, that nevertheless we are minded, have an apparent(constrained by space and time) free will, and are in a vague way aware of values: truth, beauty, goodness, love, and so forth. From necessity, infinity, and unity, we get Leibniz’s correct deduction that God must create the “best possible universe”, something that we, on Earth, have certainly not got. If we can imagine better (a hate-free world for example), so can God. An answer to the question why God created “this particular universe” or “anything at all” must accommodate all of these data points. This is not a project for a letter and I have written books and essays on the subject, but perhaps the editors will indulge a quick summary. 1. “Best possible universe” must be taken diachronically. It isn’t the “best possible” now (we are in time) but will become so. 3. #2 works to achieve #1 when persons (likely on many worlds) freely choose to avere truth, produce beauty, behave lovingly, when they use their free will in time to instantiate values into the physical world. 4. God created this particular universe to have partners (should we so choose) in the achievement of #1. Only by that partnership (apparently) will there come to be, eventually, the “best possible universe” as God conceives it — and nobody thinks bigger than God. If there was a better way to get there God would have chosen it. Now the original question is answered and the answer isn’t merely for fun. I haven’t posted a cigar review in a while. I am smoking a few sticks not reviewed yet and there are literally dozens, probably hundreds of reviews of this cigar. So why am I reviewing a 10 year old cigar (the le Bijou debuted in 2009) that I’ve been smoking since 2010? The answer is that this cigar illustrates some of the subtlety in the cigar smoking hobby. Some tastes change, some do not. My taste in rums has changed entirely in the last few years. Rums I loved as little as 3 years ago are now vanished from my collection. 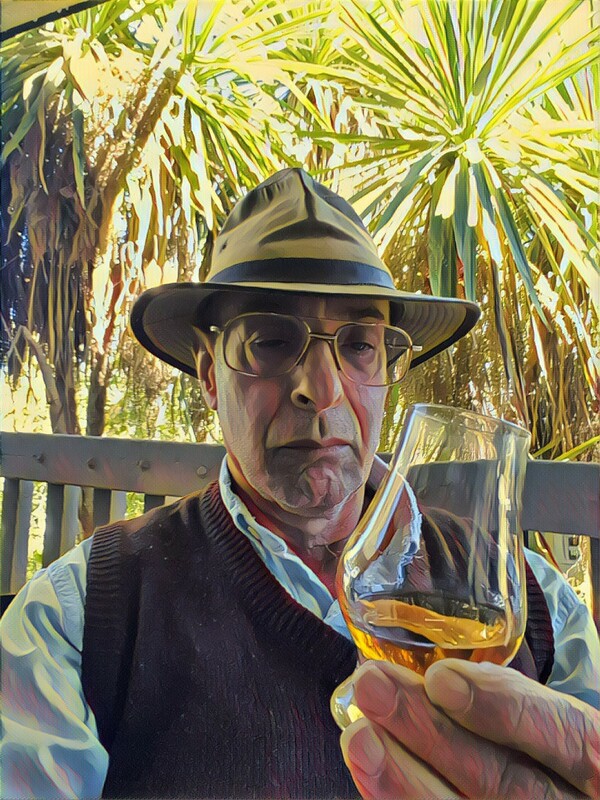 There are only 2 rums, El Dorado 15 and Dos Maderas (when I can find it) I drank in years past that I would even consider now. But cigars are another story. Sure my taste has changed. There are dozens of cigars I smoked back in 2010, even down to 2015 that I no longer buy. Some because they have become too expensive, but also many that I enjoyed, even a few boxes worth, and then stopped buying because they weren’t interesting any longer. 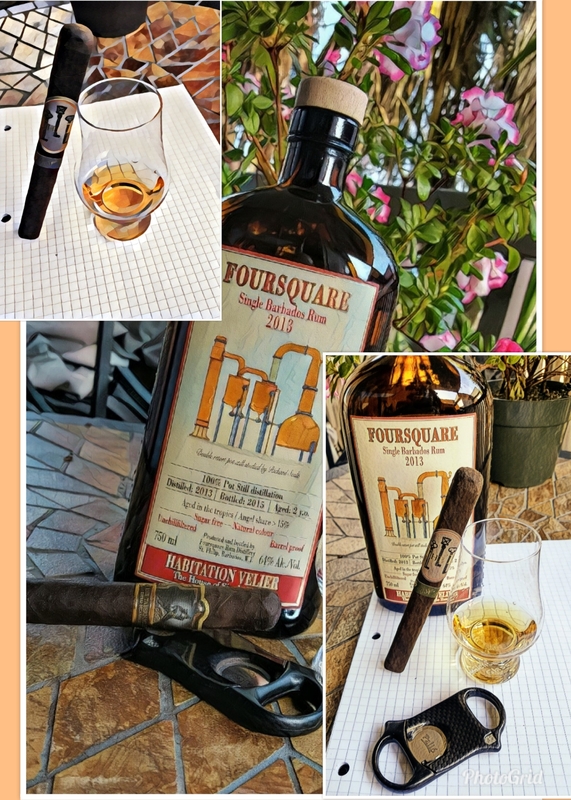 Yet unlike the rums, there are quite a few cigars I enjoyed back in 2010 that I still smoke today, or would if most of them had not become so much more expensive. The le Bijou is one of those I still like and while its price has gone up in 9 years, it hasn’t yet priced itself out of my budget. “The wrapper on the Le Bijou 1922 was particularly notable as it is known as pelo de oro, or golden hair, which is considered to be the father of the modern corojo wrapper. TobacconistUniversity.org explains that the name references a Cuban varietal that was popular in the early and middle 20th centuries but fell out of favor due to its susceptibility to disease. It was created by combining pelo de oro and Sumatran tobaccos and is regarded as being strong, flavorful and sweet”. 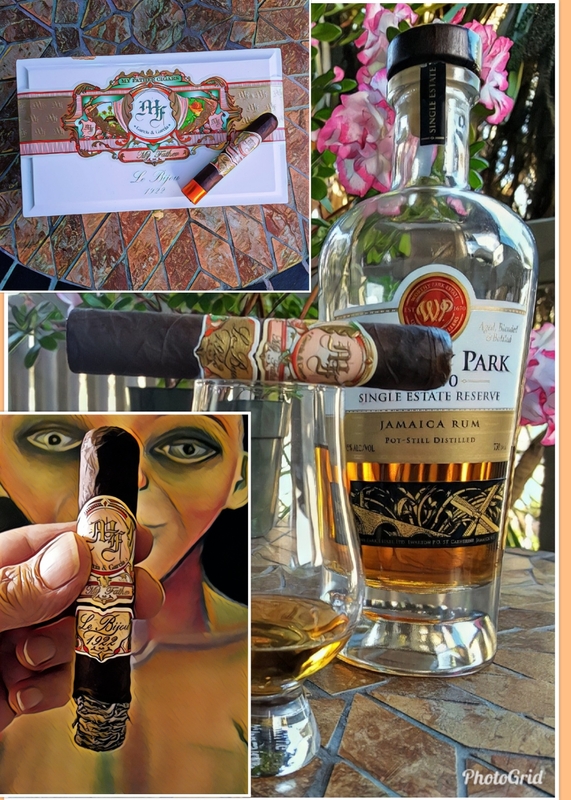 I do not find “Habano Oscuro” and “Pele del Oro” connected anywhere else.. Which is it really? Cold Aroma: Manure and barnyard. Rich and heady. Construction: Always well made, the cigar is of medium weight for its size. Evenly packed, but not dense. With a simple straight cut the draw is always good. When smoked likewise, the smoke is rich and plentiful, though see below. The burn stays pretty even most of the time though I have smoked a few hundred of these and sometimes they do get a little wonky and require correction. These smoke pretty slowly. Takes about an hour to get down to the last inch of it. Flavors: I have smoked many cigars made by My Father. Most are rich in flavors. The newer “La Opulencia” (see Review) is rich and sweet, but not this one. The le Bijou seems more like an A.J. Fernandez blend. Flavors of hay, flowers, black tea, barnyard, the barest hint of leather, perhaps an occasional hint of roasted nut. All of these flitter in and out of a general flavor of tobacco and mild pepper. The flavors first appear after the cigar is smoked for a few minutes. They come and go as the cigar progresses and do not change very much. They are never more than light hints at what should be a much richer cigar from a company like My Father. While the flavors here follow the cold aroma, that aroma is richer than anything in the flavor of the smoke. The flavors are good, even distinct, but they seem barely there. My biggest gripe about this cigar is that the flavors often disappear completely in the last inch and a quarter of the stick and the smoke gets hot and flavorless no matter how slow I smoke it. An inch plus is a lot to throw away for a four-and-a-half inch stick. I can take any other My Father cigar and smoke it down to a half-inch before the flavors disappear. The flavors of the le Bijou vanish much earlier than that, though to be fair about one out of three of them remain flavorful down to about three-quarters of an inch. See new note at end… a big discovery! This is a big disappointment in a My Father cigar. Perhaps this has something to do with how I buy these cigars. I buy boxes when there are good deals and discounts bringing the price down to $5 or so. Maybe I’m getting boxes that have sat around the warehouse a little too long and this is not one of those cigars that gets better with a lot of age? I keep telling myself not to buy these any more and then another deal comes along and I forget my own advice. This has gone on for years and I’ve probably been through a dozen or more boxes in that time. I do like the way they smoke. NO, it is not the way I buy them. I have made an important discovery that I cannot believe in the 8 or 10 boxes of these I’ve smoked over the years I had not stumbled on until now.. I’ve often punched these sticks (they take a punch well) or straight cut only a small part of the cap as I do with other cigars. But it turns out if you cut them wide, almost to the end of the cap’s shoulders, they smoke much better, require no or very little correction, and retain flavors down to the last 3/4″! The goal of this short essay is to argue the word ‘will’ and the phrase “free will” are equivalent. The ‘free’ in “free will” is redundant. All exercise of will is free. There is no “un-free will” although there are un-free actions that aren’t willed. First let me set some boundaries. I am not trying to establish that free-will is real. This argument is about the ordinary language, conventionally subjective view of our agency. We seem to ourselves (and as self-as-such) to be final arbiters of some physical (bodily) behavior, even if the result is not exactly what was subjectively intended. If with my arm, hand, and fingers, I propel a basketball towards the hoop my goal, to make the ball go through the hoop, may not be what occurs. 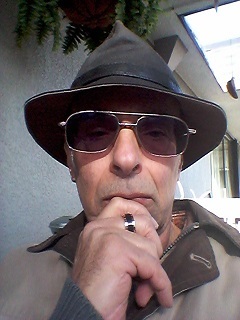 Nevertheless, it “seems to me” that I, the subjective agent, am the agent-cause of the throw. My agency caused my arm to move or at least this seems to be correct from most people’s viewpoint. My argument below does not hinge on whether libertarian free will is real, but only that it is possible. We, as agents, seem to make choices. Our [seeming] choices often precede a controlled action (behavior) of our body, and it is those physical actions that are causes in the physical world. These acts are efforts to constrain future possibility to present fact. These causes are NOVEL in the sense that they have, at their beginning a selection by a subject and not merely firing a neuron. A “selection by a subject” is novel because it does not presuppose any prior physical determinant as would the mere firing of a neuron. We are not simply aware of a choice having-been-made. Subjectively it feels like we are the initiator of the choice. A choice resulting in an act of a body seems always entangled with a willing. I decide to order item #26 from the menu before me, and in making that choice I will my vocal apparatus to express it to the waiter. Some would say the vocalization is making the choice and this would be true from a third-party perspective. Subjectively however, we do usually seem to make a choice (decide) before willing an action. This does not mean there were not physical causes (brain states) before and so impacting the choice or the willing. Nor does this mean there is anything about the experience of choosing and willing, without some brain-state correlate. What’s importantly characteristic of our experience here is that all the prior physical causes together are not sufficient, subjectively, to determine rigidly what is willed; the agent has the final vote, and this vote matters. At least this is what it feels like. Not all actions of human or animal bodies are a result of willing. Heart beat and breathing come to mind, but there are less trivial examples, including many habitual behaviors and other actions that occur without our thinking about them. Such actions are not ‘novel’ in the sense that I mean that term. They are not sui generis because they are fully determined, that is sufficiently, by prior (neurological) physical causes. Importantly, we do not usually think of ourselves as willing such acts. We are surely not willing a muscle reflex and it does not often seem to us, when habitual behaviors are called to our attention, that we are willing them either. In addition, even consciously willed acts, if they are free at all, are not free in any absolute sense. It is the body firstly that is the starting point of the physical causal chain initiated in the world. The act is always physical. Once a body acts (freely or otherwise), the causal chains started are beyond that body’s control. In addition acts themselves are constrained by the limits of what the body can do. Moreover, they are limited by what that body’s [seeming] subjective agency recognizes of its alternatives. We cannot do what the body cannot do (for example fly) and we cannot choose from among genuinely available alternatives (physically possible actions we might take) of which we are unaware. Nicholas Rescher (“Free Will: A Philosophical Reappraisal” 2009) makes a distinction between moral and metaphysical freedom. Metaphysical freedom refers to all the future possibilities that might contingently happen. Philosophers and physicists are used to the idea that the present physical universe is contingent meaning that what has happened might have happened otherwise. Many events might have happened in the universe that did not happen, and more importantly, many future events are possible and we cannot be sure which of these will occur. Metaphysical freedom in this sense has nothing directly to do with willful agency. In Rescher’s view it is genuine and we have access to it, but we have access merely because it is a property of the physical world with which we engage. By contrast moral freedom comes down to a conscious agent being free to choose from contingent futures without a constraint (agent or otherwise) fixing the agent’s act (and so will) in some specific way. If someone puts a gun to my head and tells me to open the safe I am not morally free in Rescher’s sense. But I am still metaphysically free. I could choose (and so act) to resist the gunman! I will get to the implications of Compatibilism for this argument shortly. Animals appear to exercise will. Are they also free? I believe the answer is yes, though their freedom, their awareness of potential freedom is more constrained ours. Animals can do what they want in the absence of constraint. In this sense (absent constraint) they are morally free in Rescher’s technical sense. If metaphysical freedom is real, then animals must also be metaphysically free (ontologically speaking). A lioness on the hunt willfully selects between two possible zebras present to its awareness and so willfully acts to chase one of them. But the lioness cannot choose to forgo the hunt and become vegetarian even if there is plenty of nutritious vegetable matter in easy reach. Selecting one zebra and not the other is a freely-willed act, both morally and metaphysically, within the scope of lion consciousness. Richard Swinburne (“Mind, Brain, and Free Will” 2013) argues that only a rare, deeply considered moral act, is genuinely free-willed. Everything else, despite how it might seem to us subjectively, is determined. Galen Strawson (“Free Will and Belief” 1986) argued that because so many of the past influences on our choices, beliefs, and so on, were not freely chosen, we are not free ever! Strawson’s argument is that unless every influence on a present decision was freely chosen, the present choice cannot be free at all! Strawson does nothing to address the phenomenological (the seeming) or linguistic issue here. He denies the possibility of metaphysical freedom by fiat. But both human language and experience easily distinguish between a seemingly free act and an act that does not seem to be free. Perhaps not always, but if we can make the distinction even sometimes, then metaphysical freedom might be real! If in a long chain of influences not freely chosen a single choice, however narrow, is freely elected then free will is possible. Assuming Strawson (or Swinburne) is correct in what sense are all of these determined choices “willings” other than merely being a “figure of speech” that has no referrent? If our brain alone fixes what we do in what way are we, our subjective self, willing that act at all? To be sure what seems like the result of a willing might be an illusion. But in that case, not only are we not free, we are not really willing anything either. This brings me to Compatibilism. If someone puts a gun to my head and orders me to open the safe I am acting unfreely by compatibilist lights, and yet I am obviously willing in the conventional linguistic sense. I must exercise will to move my arm and hand to the safe and dial the combination. According to compatibilists my will is not exercised freely. Here Rescher’s distinction between moral and metaphysical freedom is helpful. The gun to my head makes me morally unfree. Few would suggest that I have a moral duty to resist the gunman. Yet according to Rescher, I remain metaphysically free. I could resist the gunman, or try to escape. These are genuine options in that they are possible courses of action, future potentials not precluded by physics from which I might select. My willing my hand to dial the combination is still an exercise of metaphysical freedom. ‘Will’ and ‘free will’ do come apart in Compatibilism because compatibilists deny that Rescher’s “metaphysical freedom” exists at all. That is precisely the compatibilist’s point. By compatibilist lights, metaphysical freedom in Rescher’s sense is mere illusion. To all intents and purposes, at least as concerns macro-physics, events of universe history are not contingent but fully determined. If compatibilists are right however, it makes little sense to speak of any willing going on either way. If there is a gun to my head, my brain, and not any willing makes me, my body, open the safe. If there is no gunman, my brain might determine that I finish up some work before going home. Either way, what seems to me to be a free-choice willing (I could leave the paperwork until the morning) is not real but merely a seeming. For compatibilists, there is no will at all, only the illusion of one. Put otherwise, there is no such phenomenon as “unfree will” because there is no real will at all! If compatibilists are wrong and Rescher is right (it is metaphysically possible to resist the gunman) then any “act of will” is an act of “metaphysically free will” notwithstanding there are many past influences, not freely chosen, impinging it, or even that the choice was not morally free. If agents are metaphysically free, if subjective agents can choose between genuinely alternate futures then the subject, and not merely the brain, becomes a part of the causal chain resulting in a particular future out of many possible. If ‘will’ represents anything more than a figure of speech, metaphysical freedom has to be real. Compatibilists speak of will as though it was real but by their own lights it cannot be. We seem to perform choice-act combinations by willing. If we don’t “will it” (and I grant that not all acts are willed or free) then nothing happens; no act will issue from a body. Importantly it also seems that no act of a body that is not willed is free; we are not free to suppress a reflex and we easily distinguish between willed and not-willed action under normal circumstances. If every free act is willed, and will is not an illusion, and no un-willed act is free, then no “act of will” can be entirely un-free (fully determined) and the ‘free’ in “free will” is redundant. 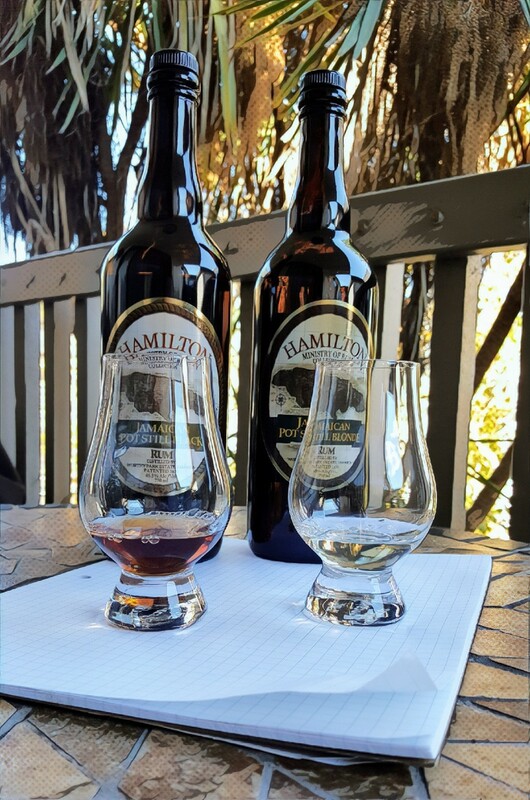 Two more rums from Hamilton, both related to the Pot Still Gold I reviewed previously and one also to the Hamilton St. Lucian rum also reviewed — see links below for these reviews. 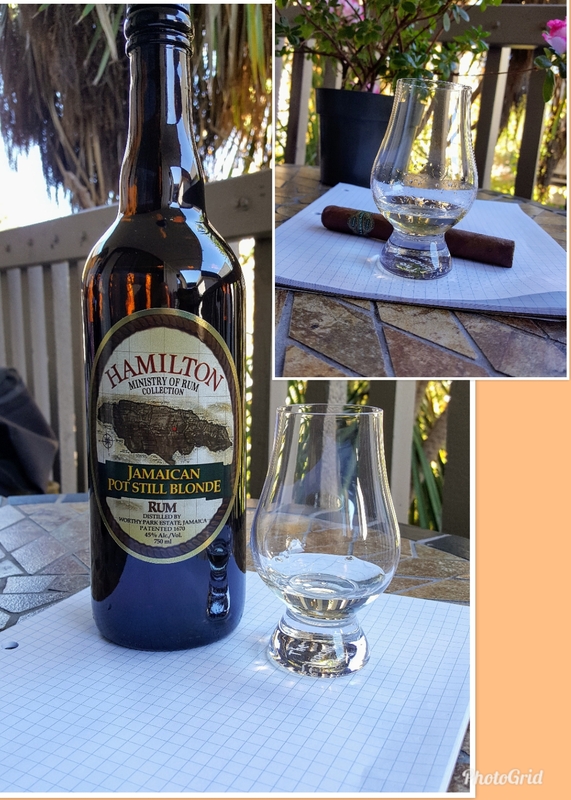 I include both Black and Blonde in the same review here because while related (both rums start from the same stock) they could not be more different. Price on these is moderate, about $35 U.S. for each 750 ml bottle. Color: Dark copper reddish. The rum, while not sweetened is colored with what the Ministry of Rum calls a “double strength black sugar-based caramel”. Aroma: Some pot still funk, dark fruit raisin, prune, alcohol, burnt caramel. The label and Ministry of Rum web site says this is a blend of light, very light, and heavy pot still rums aged “up to 5 years”. There is no mention of the sort of barrel (ex bourbon, or something else) used. The feed stock is molasses. Flavor: raw sugar cane, burnt caramel, black molasses, coffee, tobacco, over-ripe banana and a little sherry-like smokey oak. A bit of fire on a medium and sweet finish, not bitter. The funk is present but only underneath the sweetness of this rum. This is not a dry rum but distinctly sweet. The funk comes up as a background to the sweetness. Texture: A little creamy, not very, but there is some body here. Not glassy or crisp or dry. Distinctly brown-sugar or raw sugar sweet. This rum is delicious and reminds me of the Dos Maderas 5+5 if a more sophisticated (and unsweetened) version of it. Like the Dos Maderas, this is a great cigar pairing rum. I will be buying more of this one! Color: very pale yellow tinge, more pale than the Hamilton Pot Still Gold (barely) but not all the way to clear. Aroma: Funk of a sort I do not know. Rich rotten pineapple or lychee fruit. There is alcohol on the nose but all of it is overwhelmed by the aroma of rotting fruit which comes out a little like the smell of ether and old airplane glue. The label and Ministry of Rum website say there is no coloring added to this rum which begins with the same rum stock as the Black (above) and Gold (see review) pot still rums. Then aged 18 months in barrels formerly used for Hamilton’s St. Lucian rum, finally being married for 6 months with a 1-year aged light pot still rum. Flavor: A watery sort of dryness that fills your mouth with the funk of spoiled grape, way over-ripe pineapple, and lychee fruit. This might be the most awful funk I’ve ever tasted. Undoubtedly there are some rum aficionados who will relish this, but I’m not one of them. The finish is short and dry but not bitter. There is no dark fruit here, nor coffee or tobacco flavors, nor caramel, molasses, or brown sugar. The over-ripe bright fruit funk dominates everything except the alcohol which is smoothed by the fruits. 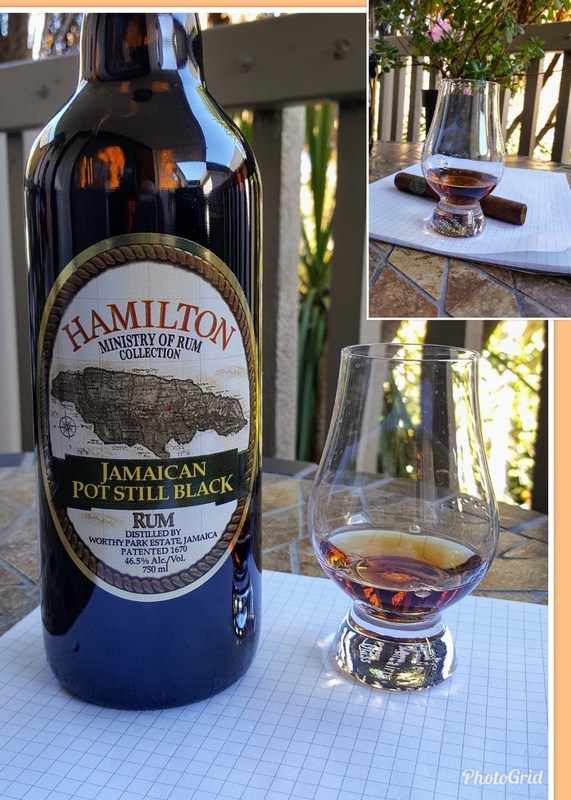 Possibly the aging in barrels used previously for Hamilton’s St. Lucian, among the funkiest rums I’ve had (see review) explains this strange and unfamiliar kind of funk but yikes, this is way over the top. Texture: Thin, watery, not creamy. There is body here but it is all in the funk. Perhaps my taste will evolve or the rum will evolve in the bottle. Right now, having had 3 glasses, I do not much like it at all. A philosopher needs both breath and depth in the discipline. There are a certain range of issues in which I have a primary interest reflected in all of the essays on this blog. But a philosopher cannot rely only on the writings of others in their field. To understand the implications of even narrow issues, one must read both opposing voices and something of other issues that may be but peripherally related. For me this is one of those books. Is self-knowledge of the substantial variety on which Cassam focuses important to me as a person? Yes to some extent it is, and in fact the author covers that “to some extent” very well in his last chapter. Is self-knowledge important to me as a philosopher? Is it important to my specific interests? In my case crucially yes, but it is not a sort of self-knowledge, a knowledge of beliefs and why I have them (I do know what I believe and why I believe), wants, emotions, and character traits addressed in this book. What I need better to understand is the quality of my evidence and whether it is evidence for what I believe. My primary interests often impinge on philosophy of mind (not our belief that other people or animals have minds, but rather what mind is, what makes mind happen in brains, and how this relates to physics, biology, etc) and much of what I believe is derived from a phenomenal examination of my own mind. I want to know if what I discover in that examination is genuinely evidence for what I believe. This is a question that Dr. Cassam misses. I make no criticism of his work here. It is clear from his exposition that the metaphysics of mind is not his subject. Who or what is this entity that believes, wants, feels, and has character traits? None of what Cassam writes here hinges on any particular metaphysical view of this entity. Yet surely an answer to this question is about one’s self? It is about what one believes constitutes the self. My interest is in what I might learn of the self as compared to knowledge about myself. While not addressing that question, this book provides a helpful context. Thanks to my reading, I am better positioned to describe that entity and what I can (perhaps) infer of it in the context of self-knowledge more broadly conceived. As with many other philosophy texts I’ve reviewed over the years this one is both professional and well written. There is almost a formula for doing good philosophy in the analytic tradition. Begin by clearly stating the nature of the problem you are going to address. Briefly review the history of the issue; make distinctions, show that the problem is more than trivial. Here the subject is something of a narrow subset of philosophy of mind, epistemology, phenomenology, and even psychology. It is the nature of what, how, and why we know, or fail to know, about ourselves as this pertains to our beliefs, emotions, desires, characters and more. Cassam sketches distinctions between the trivial and the substantial in self knowledge, and also the occasional (what I’m thinking, believing, feeling, wanting, right now) versus the standing (what do I believe, fear, want, and so on over time). Next address the various theories about the subject in the literature and show why they are inadequate, if not entirely then at least partly. This review often, and in this case does, take up much of the book. Third make a positive argument for your own theory, in this case what Cassam calls “inferentialism”; describe it carefully and show how it addresses the inadequacies of the other dominant theories in the subject area. Then address specific objections to your theory advanced by others and show why they do not have the force their authors believe they do. Cassam does all of this masterfully and manages not to be dry in the doing of it. He ends with two chapters on related matters, one being self-ignorance itself distinguished into variations and brought under his theory, and lastly a chapter on a meta-issue, why these inferences, why self-knowledge is or might be important. Is Inferentialism convincing? Well yes, given how much Cassam emphasizes its broad but not always universal applicability. His claim is that Inferentialism covers much of the ground because it can be conscious or unconscious (sometimes this last is better understood as “interpretation”) and would often, but not always, be the dominant means by which we come to know things about ourselves. In short there are a lot of distinctions to be made about what self-knowledge is, and Inferrentialism happens to address all of them (including self-ignorance) to a greater or lesser extent, but is never, or almost never, absent entirely from the process of coming to know things about ourselves. Objections to the idea are unable to gain purchase because Cassam fully accepts that other theories have explanatory power here and there about this or that sort of self-knowledge, but points out that none of these, even if they happen to be operational in specific cases, preclude an inferential component to the path to self-knowledge. It is about as neat and tidy a package as I have seen. “Self-Knowledge for Humans” would make a superb introduction to the style of Western Analytic Philosophy. In addition it well illuminates the issue and makes a substantial contribution to our grasp of what a solution looks like. This book deserves a lot of additional commentary, but I will keep it short and begin with philosophy of mind’s “elephant in the room”; free will. Hofstadter rejects free will. No such thing, any appearance to the contrary an illusion. But even worse, it is an illusion on top of an illusion (the agent whose will it is) on top of another illusion, mind, that is subjective consciousness, also illusion or at best epiphenomenal with zero power of downward causation. Of course. What else can he say? He is committed to all of this being nothing more than manifestations of physical process in the brain whose complexity in some unspecified way becomes self-referencing, creating some sort of physical effect (like a harmonic oscillation though he doesn’t say this) that magically transforms itself into our subjectivity. A harmonic oscillation (a complex pendulum) that becomes an unmeasurable (by third parties) interiority. Despite this multi-layered trickery, Hofstadter uses the word ‘soul’ many dozens of times throughout the book, even calling human beings “spiritual animals” in his conclusion. To what, in this epiphenomenal context, can these concepts possibly refer? Nothing. They are meaningless terms standing for illusory abstractions. Surely he knows that these words, in a non-physicalist context, stand for something purportedly both real (not illusory) and yet non-physical. To be sure, even in their normal context they are vague terms and there is no end of debate among philosophers of religion about what they reference. But all agree they reference something not material. But God is a fantasy to Hofstadter. Words normally associated with “God talk” can be appropriated and made to mean anything one wants. Nothing about ‘soul’ or ‘spirit’ can be real. Although the words are real enough in the English language, they literally can mean nothing what-so-ever as that to which Hofstadter applies them is ultimately an illusion. Take beauty, the simplest of the values (truth, beauty, goodness) to grasp because we detect its manifestation in the physical world. Physical things (whether natural or artifactual phenomena, sunsets or art) strike us as beautiful or not but either way the perception of beauty is something that exists only in mind. We seem to see it in the material world, but there is not much controversey about its status as a purely mental phenomenon, coming out, in what would have to be Hofstadter’s view if he is being consistent, as an illusion in an epiphenomena. While having no causal power, our epiphenomenal mind can itself have an illusion about which we might report: “that is a beautiful sunset”. But this is but another behavior determined by the purely physical operation of our brains, a report that happens, magically to coincide with the illusion arising in a causally impotent epiphenomena having no correspondence what-so-ever to any physical quality of the sunset. This leaves all of what Hofstadter says he values, the memories of a wife he loved deeply, and the children he continues to adore, his close friends, his career, all illusion. Memories are an imperfect mental record of past experience, but experience is nothing but effervescent epiphenomena. They don’t mean anything because meaning is intelligible only to a subject, itself an illusion. He likes to think he acts out of love for his children, but this is impossible unless there is downward causation. Love has an experience that is overtly more than its physiological concomitants. This part of it is quintessentially mental, and therefore epiphenomenal. There is nothing there that has any stake (and in any case cannot be a cause) in the behavioral game. Like beauty, physics does not find love in the causal mechanisms of the physical world. If Hofstadter is right, then we might as well be zombies of the sort envisioned by his student (years ago) David Chalmers. Our interiority would seem to belie that. Chalmer’s “philosophical zombies” (P-zombies) have no interiority, but then our having one makes not the slightest difference to anything we might say or do, like “I love my children”. There is no “him” (all illusion) there to love anything, only his brain that determines the verbal report made. Hofstadter declares to us that he “takes mind seriously”. Another zombie-report forced on him by his brain, just as that same brain forced him to pen that book. This is not “taking mind seriously”. If you take mind seriously, then you have to come out a bit like John Searle (whose critique of “machine consciousness” Hofstadter swipes at here and there throughout the book). Searle takes mind seriously. 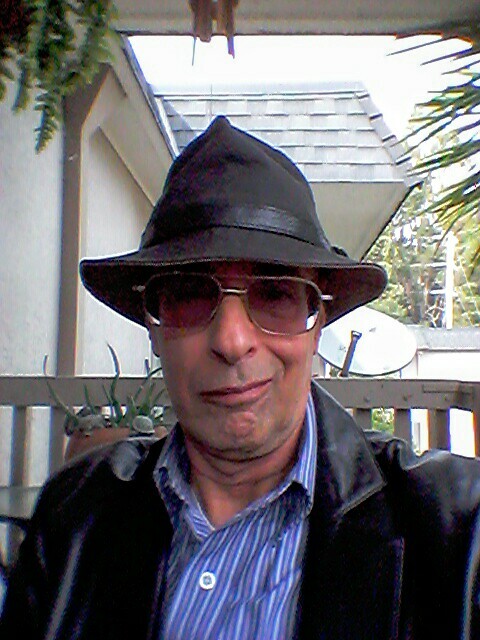 He says that he cannot shake the feeling that nothing about the entire history of human experience, not to mention the day-to-day experience of individual humans, makes any sense, becomes unintelligible, unless free will, and even personal agency (for Searle at least of a functional and not ontologically real sort) are both real. Searle, being ultimately a physicalist, admits he cannot figure out how this would be possible, but he nevertheless cannot shake the conviction that it is. Hofstadter (Searle and many others also) has another option, one that his sort of “taking it seriously” prevents him from considering. He could take consciousness, agency, and free will to be real, and conclude that therefore physicalism must be false! If one takes mind, and provisionally like Searle, free will and agency seriously, if physicalism is false, then one moves on to asking what must be the case about reality as a totality that makes these phenomena possible? What must be true about the universe if these subjective experiences are experiences of real phenomena? This is a question that Hofstadter, like Searle, cannot bring himself to ask. Douglas Hofstadter, justifiably famous for “Godel, Escher, Bach” wrote about the much trickier subject of mind and personal identity in this 2004 book. It is one thing to analyze the relation between three applications (their results in Math, visual art, and music) of self-referencing thought, and quite another to analyze the entity doing the thinking. Hofstadter begins with Godel because as it will turn out, his insight into the recursive descriptiveness of number theory from which self-reference was (supposedly) banned by Bertran Russel, becomes his inroad into a philosophy of mind. Hofstadter is a master at describing (without mathematical formalism) what Godel did and why it matters. He is not so good at applying this to mind. Besides Godel, the author’s other insight comes from the loopy-like nature of recursive entities like infinite halls of mirrors or what happens when you point a television camera at the screen displaying what that camera is viewing. We all have seen these, and from these two things, Hofstadter assembles a theory of mind based on the idea that whatever goes on in the brain at the low and mid physical levels results in some sort of abstractions (perhaps manifested in harmonic oscillations of electromagnetic energy) that from another perspective, are the very stuff of consciousness. There is nothing particularly new about this. Rejecting religion or other basis for any sort of dualism (and his remarks are rather disparaging in this respect) and declaring oneself a physicalist (there is nothing more than physics) is par for the course and occasionally swatting straw-man arguments to the contrary, is all part of the contemporary game for most of today’s philosophers and scientists. Besides religion he mentions David Chalmers who was, apparently, a student of Hofstadter’s in his doctoral days and rejects Chalmer’s non-religious panpsychism (and along with this presumably Davidson’s “dual aspect” monism as well) which is fine as far as it goes. Hofstadter’s theory is somatic. Mind arises from what goes on physically in the brain and nothing more. The problem is he never gets to connect up the subjective with anything that can, even in theory, be measured by third parties. This is not to criticize him alone here, no other physicalists (or for that matter panpsychists) manage to do it either, but in this case the author jumps from the neurological layer to the concept of self-referencing abstraction (presupposing consciousness) without pointing to anything in between that might connect the two. After declaring his theory “explained”, Hofstadter moves on to considerations of how one strange loop-abstraction, the one that fools me into the illusion of a stable “I”, is influenced and modified by others. He is much impressed by Derek Parfit’s thought experiments [supposedly] demonstrating that what we take to be the uncopyable core of ourselves, is nothing but effervescent illusion and can in fact be copied. Moreover, though we cannot copy it today (and may never be able to do that in reality) we can, from our own interiority, find ourselves being partial expressions of other people, their strange loops! He supposes that our own personal-identities form slowly as we proceed from infant to child based on all the various influences that impinge on us from the world as these come to influence new effects in our own minds. The totality of all this over time results in a relatively stable, but not changeless, personal identity. He moves on from there to suppose that those we hold and know particularly closely (our parents, wives, children, siblings, etc) can cause their own identities to be partly duplicated in our own minds. None of this really makes sense. Of course someone with whom we are close for many years will have a proportionally larger influence over the shape of our phenomenal arena. What he doesn’t seem to appreciate is that this influence takes the same pathways (our interpretation of sensory experience for example) as the initial early development of our own personality. There isn’t any loop in my brain that is a copy (however imperfect) of my wife or children’s identity, only modifications of my own that represent them. There is much here and I do not doubt that writing “I am a Strange Loop” was a labor of love in more ways than one. It is, as with other somatic theories, even possible that oscillating fields in the brain have a lot to do with consciousness and personal identity. There are still reasons to believe that this is not the whole story.